Notre Dame plays its third road game in a row this Thursday evening against a dangerous Clemson team. After Sunday’s loss to North Carolina, the Irish dropped to number 5 in both polls, but are still #1 in the RPI and are in line for a #1 seed in the NCAA playoffs provided they win the rest of their games. The availability of Jackie Young is reportedly a game-time decision. Her absence against North Carolina Sunday after spraining her ankle at the close of Saturday’s practice made a noticeable difference against the Tar Heels. Regardless, Clemson is not a team to be taken lightly. Clemson is currently 14 and 6 with 5 wins and 2 losses in the ACC. The Tigers opened the conference season against a ranked Syracuse team and suffered a nine-point loss. Clemson then reeled off five conference wins in a row before falling to #7 NC State in Raleigh by just three points this past Sunday. Their conference wins include road games against Miami (by 9) and Florida State (by 12). In the narrow loss to NC State, the Tigers limited the Wolfpack to just 6 fourth quarter points after NC State led by 9 after three quarters. NC State committed 21 turnovers and shot only 38.3% from the field and 13.6% from three. Clemson is neither an elite offensive or defensive team overall. However, they are very good at pressuring the ball and creating turnovers. The Tigers average 12.3 steals a game (#8 in the NCAA) and force 21.6 turnovers (#17). By comparison, North Carolina was creating 15.9 turnovers before this past weekend — around 205th in the country. Clemson also out rebounds opponents by 2.3 boards a game. On offense, Clemson averages 70.2 points per game. The Tigers make 42.3% of their field goal attempts. They only average 3 made threes per game — the lowest of any team Notre Dame has faced this season. They make 67.4% of their free throws. The Tigers average 13.3 assists and 19.1 turnovers per game for an assist to turnover ratio of 0.7. For the season, Kobi Thornton, a 6’2” junior forward, leads the team in scoring at 15.6 points per game. She also averages 8.1 rebounds. Thornton shoots 48.9% from the field and 58.1% from the line. She averages just over 30 minutes a game. Simone Westbrook, a 5’8” graduate student guard, also tops 30 minutes a game. She’s second in scoring at 14.9 points for the season but leads the team in ACC play at 15.1 points per game. Westbrook hits 48.6% of her field goal attempts and 29.2% of her threes. She’s the team’s best free throw shooter at 79.5%. She also leads in assists with 70 against 64 turnovers. She leads the team with 64 steals. Danielle Edwards is a 5’7” senior guard. She averages 13.5 points per game and her 21 made threes leads the team (32.8%). She’s had 61 assists vs. 64 turnovers and 57 steals. She averages 31.6 minutes per game. The other likely starters include Tylar Bennett, a 6’4” sophomore forward, who averages 5.1 points and 6.5 rebounds in 27.8 minutes of action, and Destiny Thomas, a 5’10” sophomore guard, who doesn’t shoot and score much — just 2 points per game — and plays less than 17 minutes per game. Aliyah Collier, a 5’9” senior guard, hasn’t been starting but comes off the bench to score 9.5 points and grab 6.6 rebounds per game. She’s the team’s fourth-leading scorer and second-leading rebounder. Another reserve who averages over 20 minutes of action is Taylor Hosendive, a 6’1” freshman wing averaging 5.8 points. Before Sunday, North Carolina had not beaten Notre Dame in conference play and were out to avenge a 32 point beating in Purcell Pavilion last season. ND has also won all the ACC matchups with Clemson, and the Irish demolished the Tigers last season by 53 points (90 - 53). Irish Notes: The Irish had been defending very well ever since the early December loss to UConn with Jackie Young as part of the equation. In the 12 games preceding Sunday's loss to North Carolina, which includes six ACC opponents and high scoring non-conference teams like Marquette and Tennessee, the Irish held the 12 opponents to an average of 57 points a game. ND averaged 86.3 for a near 30 points per game advantage. ND won by double digits in each of the 12 games. The opponents made just 238 of 708 field goal attempts (33.6%), and even with ND playing zone most of the time, the 12 made just 59 of 239 three-pointers (24.7%) for an average of 4.9 makes per game. No team scored more than 68 points (Louisville and Lehigh) over the span of 12 games. The closest any team came was the final 14 point margin against Louisville. The figures for the six ACC games before UNC are similar -- an average score of 84.7 to 54.8 with opponents shooting 33.2% from the field and 23% from three (an average of 4.3 made threes per game). Overall -- even including the stinker at UNC -- ND has a margin of victory against the toughest schedule in the country of 23.6 points. Young teams with Marina Mabrey at the top of the two-three zone, and they work well together to hold other teams in check. Young will also take the other team's best offensive player when the Irish do play man. She would have made as big a difference on defense as offense against UNC. On offense, her average of 4.8 assists and 2.4 A/TO ratio are best on the team (Mabrey is second at 4.3 assists and 1.9 A/TO). She also adds 14.5 points and 6.7 rebounds per game and hits 53.5% of her field goal attempts -- one of the best in the nation for guards/wings. 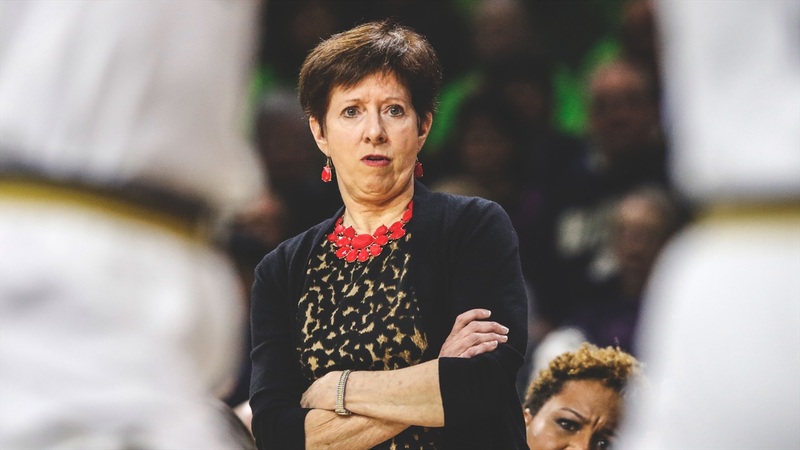 Coach Muffet McGraw has said on more than one occasion that she believes Young will be the best ever to play at ND -- I think that's because Young does so many things so well and within the team concept. ND can win a lot of games without her -- but, they may struggle to win the toughest matchups if she's sidelined for long. Lost in the loss to the Tar Heels was Jessica Shepard reaching 2,000 points in her career at Notre Dame and Nebraska. She joins Ruth Riley as the only Irish player to top 2,000 career points and 1,000 rebounds. The Irish return home this Sunday for a noon rematch against Georgia Tech. Notre Dame beat the Yellow Jackets by 21 points in Atlanta on January 6th. The game against Clemson will be available on the ESPN app. In-game updates will be posted below.